Light: Excellent light from the southwest. I observed from the south. 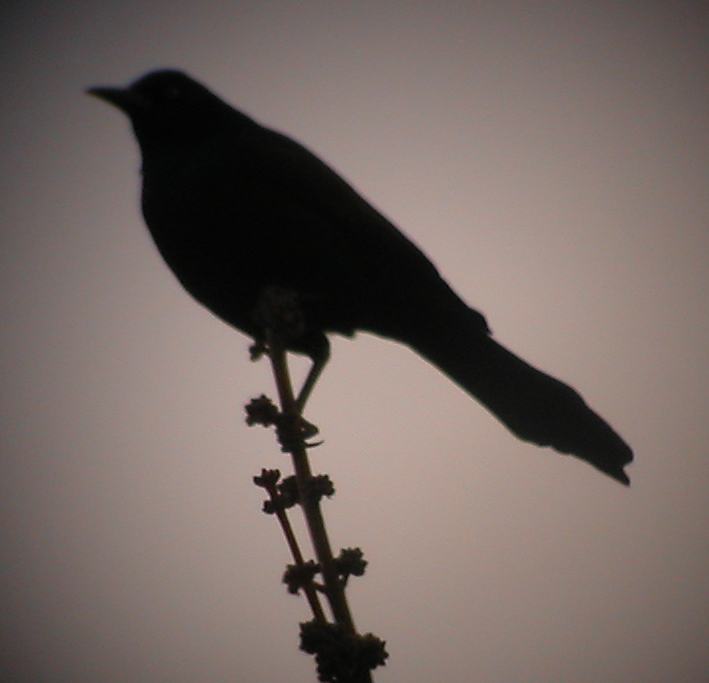 By silhouette, a blackbird with a moderately long tail (about the length of the body) and a moderately long bill (not more than the width of the head). Through a telescope, the black head had an irridescent purple sheen, and a yellow eye. The body had a bronze sheen. Behaviors: The bird perched atop a deciduous tree, then flew to another treetop, then flew down to an area where a bird feeder was located. Tail too long for the following blackbirds: Brewer's, Rusty, Red-winged, and all cowbird species. Tail and overall size too small for Great-tailed Grackle. Blackish plumage ruled out female Great-tailed Grackle. Keel-shaped tail rules out non-grackles. Length of tail and body and coloration of irridescence matched the expected grackle species for Colorado (the "Bronzed Grackle") and ruled out other North American grackle taxa such as "Purple Grackle", Boat-tailed Grackle, Greater Antillean Grackle and Carib Grackle. Extensive experience with North American grackles through birdwatching activities 1972-present.